Are hand stencils, older than 40,000 years in Sulawesi, the visual relic of Humans’ journey out of Africa? A paper published in Nature today (Aubert et al. 2014) reveals U-Th dates on calcite deposits formed over painted hand stencils and shows the stencils are older than 39,900 years old along with figurative art that is older than 35,400 years old. U-Th dating of calcite is the same method we have used to show that red panted ‘disks’ in Spain at El Castillo cave were older than 40,800 years. Hand stencils in close association with the red disks were dated to older than 37,300 years, but we think they were probably made at the same time as the red disks (see Pike et al. 2012, Science). So here we have a phenomenon of people decorating caves, notably with hand stencils, appearing more than 10,000km apart, and at least as early as the arrival of modern humans in Europe and probably also in Sulawesi even though the earliest dating evidence so far for humans there is 35,248±420 cal BP. How do we explain the appearance of such similar painted imagery at such an early age, geographically so far apart? One possibility is that cave painting was an independent innovation in both regions. 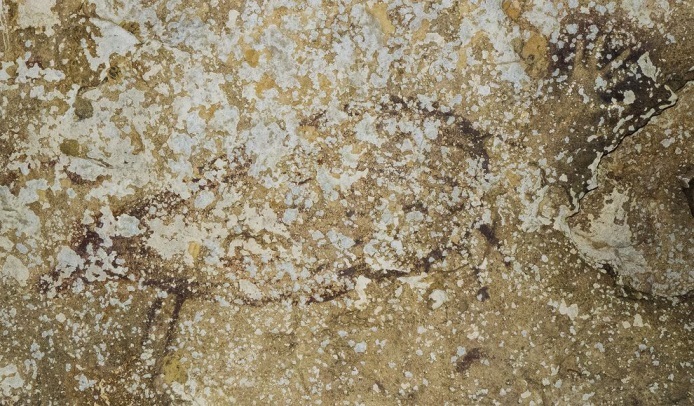 Hand stencils are common motifs in cave and rock shelter paintings in many regions worldwide and periods and cultures that are only very remotely connected. 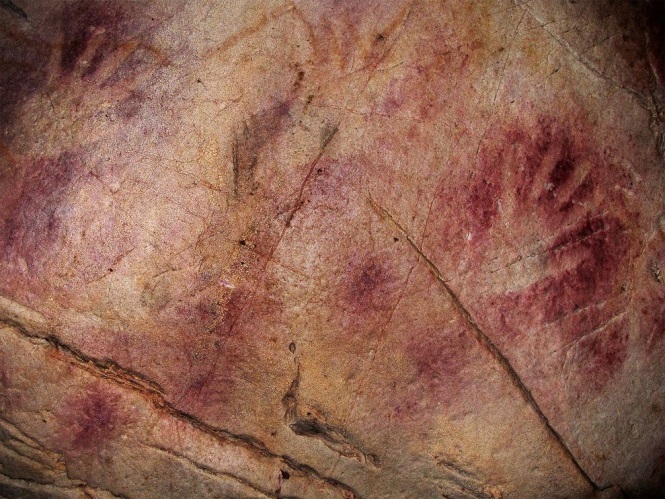 Contrast the ‘Cave of Hands’ in Argentina which has hundreds of hand stencils dating to less than 13,000 years ago, with those in Europe, SE Asia, and Australia, some older than 40,000 years. Conceivably even the development of figurative painting may be an independent innovation, linked- as suggested by my collaborator Prof. Paul Pettitt – to the realization that a hand held against a cave and painted over, produces a figurative stencil (i.e. the hand, or the most useful ‘tool’) rather than a completely abstract shape. The alternative explanation, and the one preferred by Aubert et al., is that the tradition of painting caves developed elsewhere, possibly in Africa, or somewhere along the route ‘out of Africa’, from where it spread with the dispersal of modern humans. In which case, we should find earlier cases of cave painting or its precursor, not in Europe or in SE Asia, but somewhere between the two. This is certainly a testable hypothesis, and the race surely is now on to find it, though the difficulty is that because we are dating calcite deposits, mostly the ones that formed on top of paintings, we usually only have minimum ages for the art. We may have already found the oldest art, but not the oldest piece of calcite. Or conversely, the calcite we have so far dated is many thousands (or even tens of thousands) of years younger than the art. So to be scientifically rigorous, with minimum ages we must not be too quick to fall back on our preconceived expectations – even if these are based on undated but ‘in sequence’ (i.e. stratigraphically ordered) archaeological evidence. These various artworks are certainly 40,000 years old, which neatly fits with current models of ‘art making’ modern human dispersals out of Africa (say 60,000 years ago), but the art could be 50,000 years old, 80,000 years old, or whatever. This is the first time we have been able to be reliably date it; we are breaking new ground here. And if we thought the dating evidence was now overwhelming, I suspect both teams would have stopped taking samples, which we haven’t. Aubert’s et al. evidence has forced a very significant reappraisal of some existing models of the origins of cave art, and does challenge the notion of a single European origin for cave art (though with minimum ages this will remain difficult to ‘prove’), but there are still many more samples to date. We should remain open to the unexpected. Not only because we have a new way of dating cave art, but also because – as Aubert and colleagues have so clearly demonstrated – in order to test some of these age-old hypotheses, we Europeans might now need to stop looking in our own backyards.